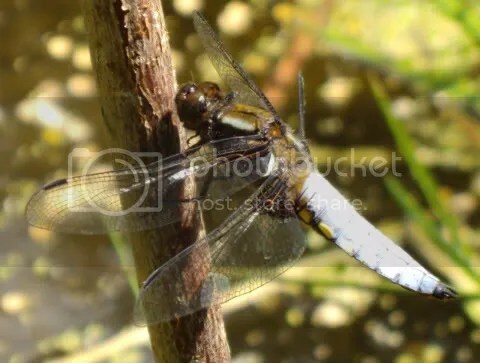 When I was busy describing the Golden-Ringed dragonfly a day or two ago, I forgot to include the other dragonfly that was determinedly guarding its territory down at the pond last summer: the Broad-bodied Chaser, Libellula depressa. As he’s rather gorgeous, it’s very remiss of me! The photos aren’t quite good enough to portray the beautiful, almost luminous blue of the tail. 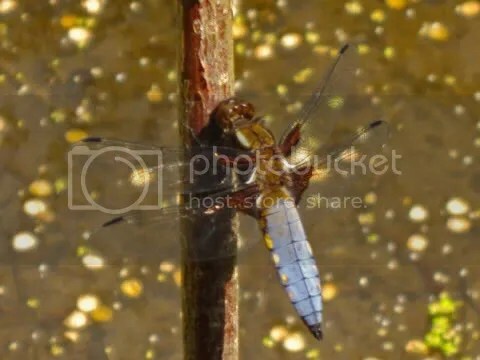 Gorgeous or not, the Broad-bodied Chaser is one of the most common dragonflies in this part of Europe and patrols his territory, flying down the perimeters of the pond and returning to a sunny vantage point – this stick projecting over the water providing the perfect resting place. The female has a golden body without the distinctive blue colouring. Usually seen from April through to September. Mating occurs on the wing and usually takes a minute or less. Eggs are usually laid onto pond underwater vegetation and are deposited as the female hovers above the surface ovipositor dipped into the water. Eggs hatch in about 5 weeks and larvae take up to two years to develop.